Thrifting is a lot of fun. Stepping into a second-hand shop is like a treasure hunt, you never know what oddities you’re going to find. Maybe it’s just weird junk but maybe you’ll stumble on something valuable. If you don’t have time to browse the shelves of thrift stores in the wild, check out Shop Goodwill, the bidding site for second-hand goods. 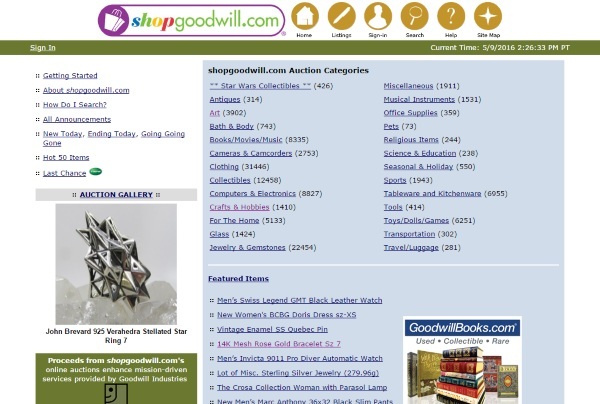 This site is affiliated with Goodwill and is basically an online searchable listing of secondhand items. They’ve been broken down into categories for easy browsing or you can search for a specific item or type. Once you sign up for a free account, you’ll be able to bid on items. Or, you can just watch bids. A few minutes on this site will likely serve up a few items of interest. There are old clothes but also new(er) electronics and the like. Just be warned, everything is sold AS IS. Still, if you’re looking for something to browse or trying to find something that has been out of production for ages, check out the website. There’s a thought, Donyae! As a hobby, drive up the price on things that people in poverty need to survive. But then, a few days ago you were endorsing a large piece of cardboard masquerading as a portable desk that cost $250, and describing it as disposable. I get that you’re out of my tax bracket, but do you need to encourage people to bid up the cost of things for those less fortunate? Definitely so, Nigel, but there are so many avenues already in place like eBay and Craigslist for that sort of thing. Goodwill is a different animal with a different audience. I see Fred. I am obviously not familiar with that particular outfit in detail, but from a quick look at the site, it appears that it is a new auction service being offered by Goodwill themselves, as a way to raise revenues for their stores and training services. As far as I can see, it also focuses on more luxury type items – ‘a wide array of art, antiques and collectibles as well as new and nearly new items pulled from their vast inventories of donated goods’ – to quote. You can find out more at http://www.shopgoodwill.com/help/AboutShopgoodwill.asp . All the best.